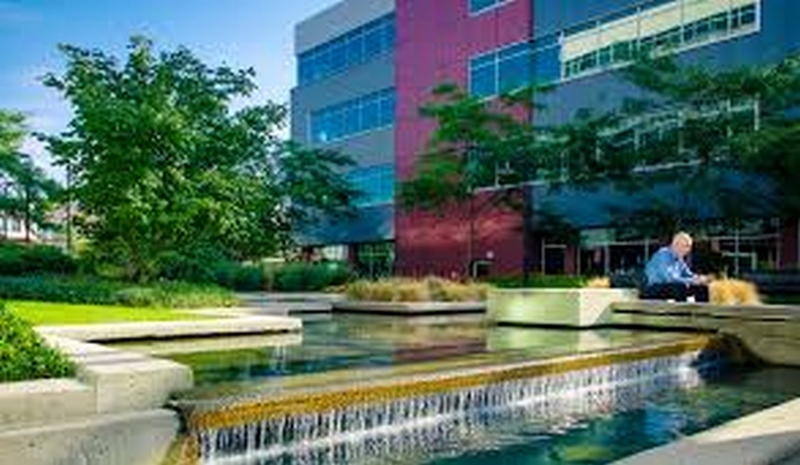 Vancouver-based landscape architectural consultant Randy Sharp, formerly with Sharp & Diamond Landscape Architecture, will be leading a tour of the award-winning Broadway Tech Centre (BTC) on May 7, 2019. 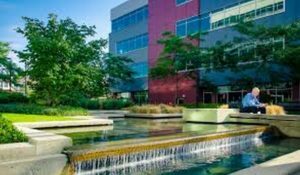 Randy has received several major awards for landscape design of the BTC which transformed a seventeen acres of an under-utilized warehouse space in Vancouver into a world class high tech campus. 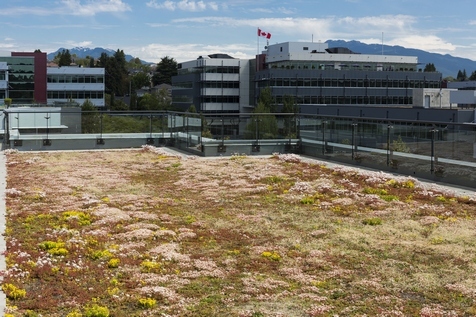 BTC hosts eight buildings four of which have 10,000 square metres of green roofs that help with stormwater management. The campus is beautifully landscaped with waterfalls, contemplative and lively common spaces creating an urban oasis on this former brownfield site. The LEED USGBC-CS Platinum certified campus consists of a grid of pedestrian-scaled streets with 8 individual buildings interconnected by walkways and elegantly landscaped spaces. A dedicated city street, known as Virtual Way, has been constructed over the underground parking. Four of the eight low-rise buildings are covered with a total of 10,000 square metres of lightweight vegetated roofing with a combined water storage capacity of 460,000 litres, or more than 1,500 bathtubs of rainfall (based on a 300 litre per bathtub). Dr Karen Liu, product manager for Low and Bonar, and green roof researcher and innovator for close to two decades, will join Randy and answer technical questions. 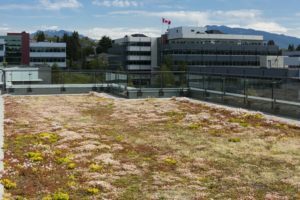 Every year, the 4 green roofs absorb 10 million litres of rainfall, equivalent to 4 Olympic sized swimming pools, evaporate and return it back to the atmosphere, thus diverting it from our stormwater infrastructure. This thin-layered system has a superior water retention to weight ratio and retains 46 l/m2 and weighs 69 kg/m2 saturated. 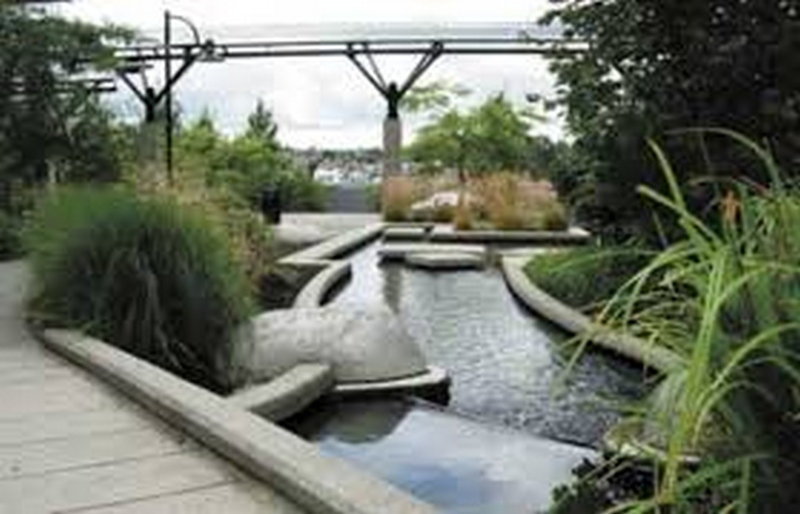 It is comprised of a locally grown roll-out sedum mat with 8-10 species of drought-tolerant sedum. System underlayers include mineral wool and fleece as retention layers along with a drainage layer and root barrier. There is no automatic irrigation. Hose bibs are available for watering during prolonged periods of drought. 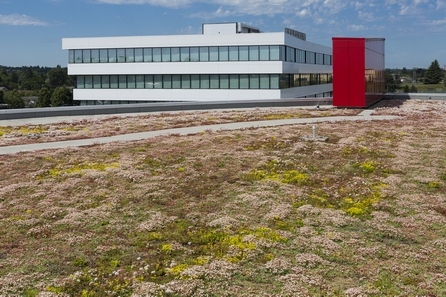 The green roofs function for both heat gain and loss moderation and for the aesthetics of views from other buildings on campus as well as reduce energy use, lowering tenant operating expenses. 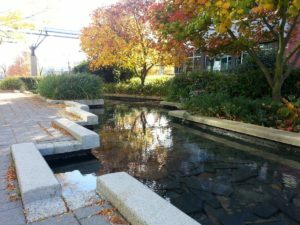 The campus is landscaped with native natural elements and reflective pools and waterfalls offering contemplative and lively common spaces. Drought-tolerant plants, native to coastal BC, including Pacific Dogwood, Vine Maple, Sword Fern, Salal, Oregon Grape, Evergreen Huckleberry, roses, grasses and wildflowers are featured. The mineral-rich planting soil, consisting of 100% recycled materials including decomposed bark, compost and river pump sand from the Fraser River, was specifically created for the rooftop gardens. The campus includes a sports field, café patios, entrance plazas, and the thematic use of water creating places for both active and passive recreation. A state-of-the art irrigation system was programmed to respond to the specific soil type, exposure and plant requirements of the roof area. This contributed to a 51% drop in water consumption. Built to be a cyclist friendly environment, it is located on the Central Valley Greenway. Hence, over half of the employee population commute to and from Broadway Tech Centre without the use of a vehicle, choosing transit or cycling options instead. Broadway Tech Centre is managed by QuadReal, a world-class, Canadian-owned real estate company owned by the British Columbia Investment Management Corporation (BCI), one of Canada’s largest institutional investors. 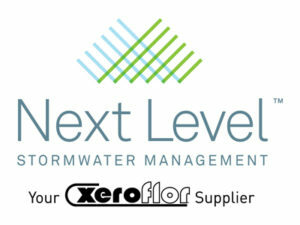 Contact us to help you with your green roof project.